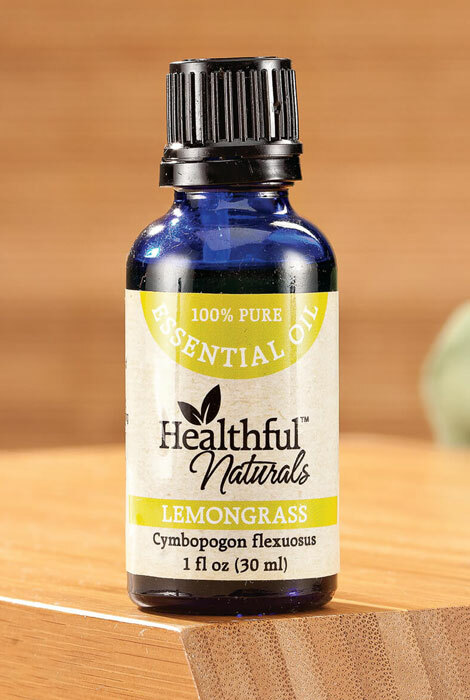 Beyond its fresh citrus herbaceous aroma which can heighten awareness, 100% pure Healthful™ Naturals lemongrass essential oil boasts cleansing, antiviral, and antimicrobial properties, and is a safe, natural solution for repelling insects. Steam distilled from the grass, our lemongrass oil also helps encourage healthy digestion, is an ideal choice for massage therapy, and provides purifying and toning benefits to skin. Used in aromatherapy (diluted in water in a diffuser) its purifying, invigorating and shielding properties may help promote positivity and increase awareness while purifying the air. Dilute in water to clean and degrease home surfaces or put 1-2 drops into a load of laundry to freshen it. Can be used diluted in a carrier oil for topical use. Many oils blend well with lemongrass, including basil, cardamom and spearmint. Complete with orifice reducer cap for slow drop delivery, the generous 30 ml (1 oz.) bottle includes approximately 500 drops. Not intended for internal use. I use it in my hand scrubs. Helpful in so many ways! I use essential oils not only for personal use, but for my homemade cleaning supplies. They smell great & have a great antibacterial property to them. I love these essential oils. I am just lesrning more about them. I have 6 different ones and will probably buy more. I love the Lemongrass scent. The clean and refreshing scent of lemons plus the sweetness of newly mown grass.